Aluminium is a robust building material capable of lasting decades without the need for significant repair. Even so, simple methods should be employed to maintain aluminium windows and doors to ensure they stand the test of time. Here are some top tips for keeping your windows looking great! If you’re considering upgrading your home by replacing your windows or doors, you’re probably wondering which material is best for your needs and within your budget. We offer a variety of timber doors and windows, as well as uPVC frames for a range of glazing options, but for a modern look that requires minimal upkeep and to ensure a long life, aluminium is a smart choice. 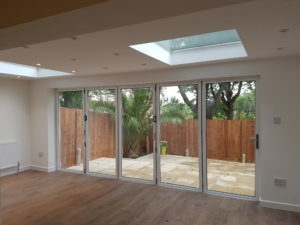 When it comes to doors, aluminium bifold doors are a particularly trendy option that will allow you to bring the outdoors inside in summer months, offering a sleek and contemporary look. Our bifold doors are essentially floor to ceiling windows that can transform the look and feel of any property. Despite the increased longevity that homeowners find when they upgrade to aluminium, we want to show you how to maintain aluminium windows and doors so that you can be confident in them looking as new as the day they were installed for years come. How Often Should You Clean Your Aluminium Windows and Doors? There are no hard and fast rules when it comes to the maintenance of aluminium windows and doors — a lot comes down to personal preference when thinking about cleaning and maintenance routines. As a guide, however, we would suggest that you clean the glass around once a month and the aluminium frames every two months. The great thing about aluminium is that it’s naturally easy to clean, and even if you forget for a few months, it’s highly unlikely that any lasting damage will have been done — to both the integrity of the material and its appearance. Cleaning both the inside and the outside — a lot of people neglect one or the other! Ensuring the glass dries evenly. If you can, pay close attention to how streaks form and how your windows dry as you go. Once you recognise how your particular glazing reacts in the position that it’s in, you will find it much easier to implement an easy maintenance routine as time goes by. The process of maintaining windows is actually very straightforward. It does rely on you having some key pieces of equipment, but once you have the right tools, learning the right techniques will pay dividends in the long run. 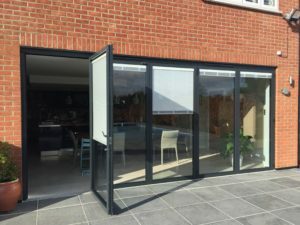 A lot will depend on the size of your windows, but we will look at the biggest type of window you’re ever likely to have and examine how to maintain aluminium windows in bifold doors. If your windows have been left uncleaned for a long time and are in need of some serious TLC, you may also need a dry bristle brush. You can use this to remove any cobwebs and dust before you start to clean with soap and water. Repeat the same technique from the other side of the glass. The most common issue when washing windows is the appearance of streaks. Streaks are sometimes caused when the window dries unevenly, due to some parts being in shadow and others in direct sunlight. However, the most common reason for streaks is the cleaner’s squeegee technique. It’s not a naturally occurring talent, but you can teach yourself a better technique quite easily. Don’t be afraid to have a quick look at other how-to guides for this specific aspect of the process. Getting light into your home through a pristinely clean window is something you should value — and no one likes the appearance of a smeared window, including passersby — so doing this type of research isn’t over the top. Powder-finished aluminium doesn’t corrode easily and, as such, it’s a really easy material to clean to good effect with minimal effort. A powder coating protects the aluminium frame from scratches and abrasions. Much like a non-stick pan, when thinking about how best to maintain your aluminium windows or door frames, be careful not to use abrasive sponges or cloths when scrubbing. Harsh cleaning products should also be avoided. Anything containing bleach or other strong chemicals should be used very sparingly or, ideally, not at all. Regular light cleaning will ensure your aluminium window frames are maintained to a high standard anyway, so you shouldn’t feel the need to use a deep-cleaning product. A household detergent and warm water wiped across the frames should do the job without any issues. What’s more, aluminium frames are usually very narrow to ensure maximum natural light, so cleaning the frames won’t take long in most cases. Finally, dry the frames with a soft and absorbent cloth. You should always avoid scrubbing stubborn stains too hard, as you may take some of the powder coating with the stain. Sometimes, small stains are best left alone, however, preventative measures should be taken in the future to ensure fresh stains don’t appear. Unlike with glass, you should find that streaks are not an issue when cleaning aluminium frames. There should be no need for you to use a squeegee on the aluminium sections of your window, but this is an option — just be careful not to put a ridge or crease in your squeegee, and always be gentle! Wipe down the frames of your windows or doors with a damp, non-abrasive cloth to make sure any dirty water isn’t dripping and drying. This will cause streaks and they will be noticeable! Re-hose the frames again once they are clean, as any water dripping down will be clean and shouldn’t leave any marks. If there’s one important takeaway when it comes to maintaining aluminium windows, it’s to make sure you clean them on a semi-regular basis. Your windows will need cleaning more often than the frames, but combining the two tasks makes a lot of sense — especially since you’ll already have the required tools to hand. As previously mentioned, with aluminium frames, windows and doors are less likely to fall into disrepair, but a little maintenance can go a long way. You don’t need to employ a window cleaner to get the basics done — cleaning can be therapeutic, putting you in touch with your home like nothing else. Have a look at our wide range of sleek and stylish aluminium bifold doors and see how you could transform your home for the better!